Profiles in History is auctioning off over a 100 Back to the Future props but the one that's got me—and about the entire rest of the world—shaking in my boots is the DeLorean used in BTTF III. It's one of only seven DeLoreans used throughout the entire series. The DeLorean being auctioned off is the one that Marty McFly "used in the 1955 drive-in movie scene when Michael J. Fox drives it into the past and lands in 1885 to find Doc". The auction house says it's one of only three to have survived after filming. I've always said when I could afford a DeLorean, I was going to buy one but... I can't afford this one. 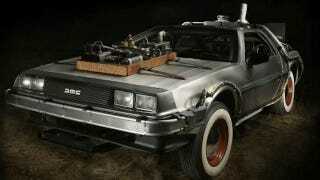 The BTTF III DeLorean is expected to fetch $600,000. Gulp.